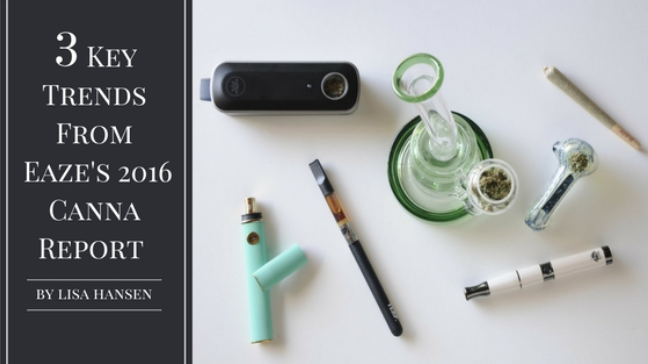 If you haven’t read the 2016 report from online cannabis delivery service Eaze, you need to take a moment now to do it. This goes double for anyone trying to understand the California cannabis market! Find it on the Eaze site here. And while we’ve already passed the 4/20 mark in 2017, in our opinion it reads like a current trends report. With our solid background in retail food marketing, we know a great piece of data when we see it. Like many other industries, retail grocery relies heavily on data to make product decisions, evaluate category performance, blah blah blah. It’s been interesting to see the data services and opportunities unfold in the cannabis industry, and clearly we’re just getting started. We love that Eaze took the time to put this out. #1 Ordering Online Keeps GrowingNot a shocker, but kind of mind blowing that an order is placed on Eaze every 30 seconds. Make sure you’re evaluating your e-commerce opportunities alongside your standard dispensary/distributor/wholesale channels. #2 The Nuances of Northern California vs. Southern CaliforniaNor Cal cannasumers adopt new products more quickly and are buying more edibles, concentrates and vaporizers while SoCal cannasumers are buying more flower. Think regionally when it comes to product launches, expansions and promotions. This applies certainly for CA, but in other markets too. #3 Women & Boomers = Opportunity This is quite validating for us at Plaid because we’ve been talking women + cannabis all along. Eaze reports that 1 in 3 of its cannasumers are women (!) And if you know our company’s story, you’ll know that the boomer data point hits home too. Eaze reports a spending increase of 25% from boomers while millennials are down 3%. This is exciting for us too as we’ve personally seen the health benefits for boomers when they find a cannabis treatment that works for them. There’s a lot of opportunity to reach growing cannasumer demographics with products, formats and marketing that is relevant to them. The market is so much more than the stereotypes out there. There is no time to waste when it comes to grabbing share of the cannabiz market. Big business is quickly making it’s way into the industry and the marketing game is about to step up big time. We’re looking to partner with the companies that see the potential, and have the gusto to go after it. Are you one of them? Then let’s do this.